We've been enjoying a conversation with a new friend, Andrew, who is a school teacher. Andrew is teaching his students Zentangle tangles and other patterns and encouraging them to tangle their notebooks as they take notes. Quoting Andrew, ". . . human memory is visual, not literary." If you can, take a moment to enjoy this TED lecture on memory; it is a good background for this conversation. Maria and I often talk about the benefits of putting pen to paper to create structured patterns (tangles) without a predefined outcome. Some of these benefits include relaxation, confidence, creativity, and focus. I think we can now add "memory aid" to this list. After reading about Ars Memorativa, we've learned that illuminated letters and margin decorations on early manuscripts and books were done more as a memory aid than just as decoration. What a wonderful poetic symmetry that our inspiration for what became the Zentangle Method originated from Maria's experience as she embellished a large illuminated letter! I think it's also possible that when people create their own unique visuals to accompany an event they are more likely to remember that event than if someone else supplies the images. For instance, for much of our human experience we maintained our traditions orally. As each person heard the story, he or she would form his or her own mental image. Similarly, when reading an unillustrated book, or listening to a radio, we each create our own visuals. However, with the advent of illustrated books or televised images, we no longer create our own visuals; we use the ones provided. 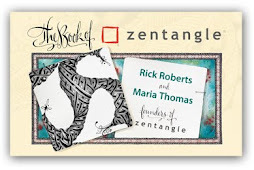 When we first started teaching our Zentangle Method, we gave a workshop at a local bookstore in our town. Some months later, one of the students who attended stopped us on the street one day to tell us a story. She described how she went to church services for the benefit of her sons, but she was so easily distracted that she never remembered the sermon. One Sunday, after taking our workshop, she thought, "I'm not going to remember what is said during the sermon, so I might as well tangle." She had her pen, pencil and some Zentangle tiles with her and she tangled all through the sermon. She said that Sunday, for the first time ever, she remembered the sermon! I'm wondering what would happen if she returned to different tiles that she did on different Sundays. Might she remember even now the topics discussed? I know that there are certain tiles I created years ago that when I see them I immediately remember where I was and what was going on. Thank you, Andrew, for bringing attention to this application for the Zentangle Method. We invite everyone to share their stories and insights on this topic.